Paranoia can hit anyone, regardless of how stable they think they are. Sometimes we over think information or become insecure about something, and that nervous energy suddenly strikes. Often each person will have certain things that affect us and bring out our more paranoid side. 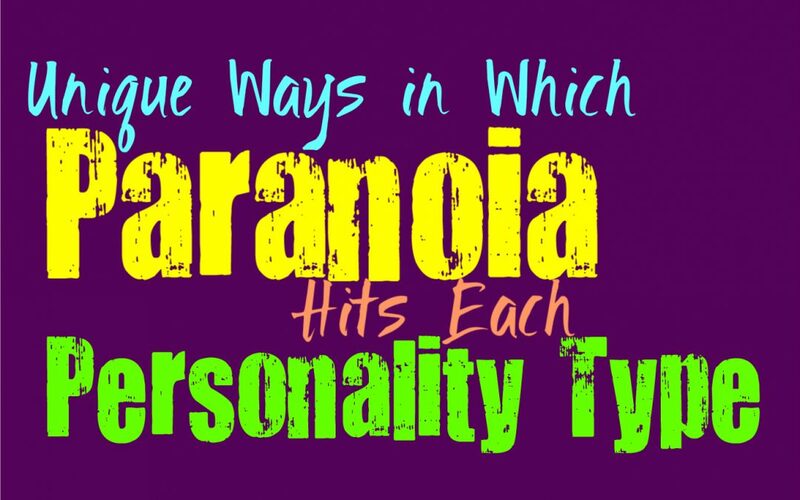 Here is how paranoia hits you, based on your personality type. INFJs can become paranoid when they aren’t trusting their intuition like they should be. When they stop relying on their intuition to guide them they can become unsure of which path to follow. During these times the INFJ can seem a bit scatted and so they struggle to really figure out their next move. INFJs can also become a bit paranoid when they care deeply for someone and might be afraid of losing them in some ways. When their intuition gives them subtle hints it can lead them to overthinking and becoming anxious about their relationships. ENFJs are likely to become paranoid when they aren’t relying as much on their intuition. When they are trying to figure out the answer to something and they search for others means of solving these problems, it can cause them to overanalyze. ENFJs don’t intend to become paranoid about things, but it can happen when they are stuck in a bit of a rut. They can also overthink situations when they can pick up on changes in someone’s behavior, but aren’t quite sure of the details of what is wrong. The INFPs paranoid side often comes out when they spend too much time overthinking things. They can become so caught up inside of their own thoughts that they struggle to really pay attention to the world around them. Sometimes getting caught up in their inner worlds can draw them away from reality a bit. When this happens the INFP can become paranoid of some things when they’ve spent too much time overthinking and analyzing it to death. This isn’t something they do intentionally, they just have such complex inner minds which can take them towards so many different potential outcomes. ENFPs can be a bit paranoid sometimes, especially since their minds can become caught up in so many different patterns. They are good at analyzing and their intuitive abilities can come up with so many potential outcomes. Their minds can get wrapped up in thinking through the ways something could go wrong, and this can send them down a slightly paranoid path. ENFPs can certainly overthink things, and can consider all of the more far out possibilities that make them appear a bit paranoid at times. INTJs aren’t often paranoid people, mostly because they like to look at things from a factual point of view instead of considering all of the possibilities that are unlikely. Their minds zone in on what is accurate and can be proven true or false. The times where the INTJs paranoid side might come out, is when they aren’t trusting their intuition as much and might be drawing more towards their other functions. When this happens the INTJ might be relying on other means to come up with solutions, and so their minds can wander to a more paranoid place. ENTJs don’t often come off as paranoid people, but sometimes their minds can overanalyze things. They can consider the more conspiracy type theories, especially if it makes the most logical sense. When the ENTJ appear paranoid it is often because they are right about something that other people just can’t understand. They often follow facts and evidence that is in front of them, and don’t like to veer off in directions that don’t make complete sense. INTPs do have a paranoid side to their personalities, mostly because they overthink things. INTPs have complex inner minds, which they spend a lot of time diving into. They have a knack for considering all of the potential outcomes, but sometimes if left unchecked this can turn into something a bit more troublesome. When they can see the millions of ways something can go wrong, it can cause the INTP to seem a bit paranoid. Overthinking things without an obvious solutions can leave them feeling like they need to do whatever they can to avoid the bad things. ENTPs are often seen as logical people, but that doesn’t mean they don’t have moments of being a bit paranoid about things. They try to focus on the facts, but their minds also consider all of the different potential outcomes of a situation. Their minds run through so many different things at once, that they can go off in different directions sometimes. ENTPs can become a bit paranoid when they can see all of the ways something can go wrong, and so they try to figure out contingency plans for these situations. This can cause them to seem a bit paranoid, but sometimes it is because they are aware of where things might end up. ISTJs try to focus on the path in front of them, and so this often keeps them from getting paranoid. They don’t like thinking about things that might happen, instead they just want to do whatever they can to prepare for what likely will happen. ISTJs do want to be prepared for the future, and so they work hard to keep themselves aware and educated. When the ISTJ can become hit by paranoia is often when they are feeling a bit overwhelmed by the world around them, and they can actually see factual evidence towards something that others see as unlikely. ESTJs try to remain focus on the path that matters to them, and so they do their best to avoid becoming paranoid. ESTJs work hard to get things done and so overthinking things can only lead to them making mistakes. In most situations they want to avoid paranoia in their lives, and instead strive to focus on facts and what will likely happen. When the ESTJ becomes paranoid it is often because something serious is happening in their lives, so it forces them to reconsider their usual methods. ISFJs try to avoid paranoia as best they can, so they often focus on more practical means. They are good at getting things done and do whatever they can to take care of their loved ones. For the ISFJ it is important to hold it together for the sake of those around them. When paranoia hits them it is often because someone in their life is acting strangely, and while they can pick up on this sometimes it is hard for them to completely figure out why this is happening. ESFJs are usually practical and reasonable people, and so they try to avoid becoming paranoid. While they often try to focus on what is in front of them, there are times when their minds can overthink things. This often happens for the ESFJ because they are overwhelmed by too many things at once, and they feel like they might fail. ESFJs can also become paranoid when they sense that something is wrong with a loved ones, but that person refuses to tell them what is truly going on. ISTPs aren’t usually paranoid people, since they like to focus on the facts of a situation. They don’t like allowing their feelings to cloud their judgement and cause them to overthink in a bad way. ISTPs try to focus on what is right in front of them and can clearly be proven true. Their minds can certainly analyze a situation, but they try to stop before going towards a negative place. When the ISTP becomes paranoid it is often because they are dealing with a struggle that causes them to focus less on their dominant function. ESTPs try not to be paranoid, and often focus more on facts. They look at the world around them and follow what can be proven without fail. ESTPs usually aren’t paranoid people, instead they are more logical. When ESTPs can become a bit paranoid is when they are focusing on someone they love, and feel a bit confused by their strange behavior. If someone the ESTP is close to, seems to be behaving differently and won’t explain why, it can cause them to overthink and become a bit paranoid. ISFPs can become a bit paranoid when their emotions take control and lead them down an uneasy path. They often try to remove those thoughts and focus more on enjoying the moment and the more pleasant things in life. While they try not to be paranoid about things, ISFPs can allow their emotions to cloud their thoughts sometimes. When they feel uneasy about something it can cause them to overthink the situation and become paranoid about what is going on. ESFPs can become a bit paranoid because their intuition is their weakest function, and this can cause them to sense things are off. When the ESFP senses something it can be a bit confusing for them, since they don’t have clear answers to why they feel this way. Mixed with their strong emotions and desire to focus on the present moment, the ESFP can certainly become paranoid. The struggle is that they don’t usually know why, and can become a bit emotional about the situation.